Shortly after I began work in earnest on Reflections, my second serenade for wind dectet, the great English bassoonist William Waterhouse died. We attended the same school (Whitgift in South Croydon) and I followed his remarkable career as he climbed to the top of the profession both as a performer and a teacher. He was loved by all for his wit, wisdom and scholarship. The second movement begins and ends with a bassoon solo in Bill’s memory. The outer movements which frame this ‘In memoriam’ are reflections on the witty, humorous side of Bill and my own memories of a happy childhood with musical parents – my father led a dance band and my mother was the daughter of a church organist and sang rather well. The first movement contrasts energetic, melodic material in five-eight time, with a ‘big tune’ in three-four derived from it. After further development, this returns to end the movement. The finale starts quietly with a short bridge passage to take us out of the mood of the slow movement into a much racier, even jazzier mood which, after a gentler waltz-like interlude, returns to bring the piece to a rousing conclusion. Reflections was commissioned by Simon Payne and the Oxford Sinfonia, to whom the work is dedicated with affection. The first performance took place at St Mary’s Church, High Street, Oxford on 26th April 2008. It was a triple pleasure to hear the Oxford Sinfonia Wind Ensemble concert: for an excellent performance, for the unusual programme, and not least for a world première. Thousands of “Harmoniemusik” works from the central European classical tradition have survived. The tradition developed into the classical octet (pairs of oboes, clarinets, bassoons and horns) as we heard in the Hummel Octet in E¨. Harmoniemusik was initially entirely arrangements, and we heard two excellent examples, Haydn and Antonio Soler by Derek Smith and Guy Woolfenden. These and Woolfenden’s own compositions included flutes, as did the Gounod Petite Symphonie, commissioned by the Parisian flautist Paul Taffanel. The Sinfonia’s lead flute, Chris Britton, rose splendidly to its near-concerto style. 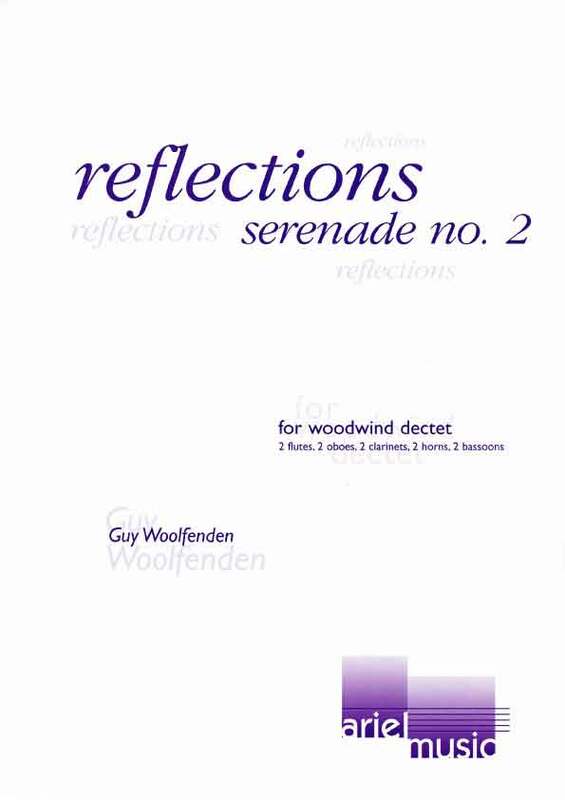 Guy Woolfenden was for 37 years Head of Music at the Royal Shakespeare Company, and is known internationally for his compositions for wind ensembles. The Sinfonia has rendered a valuable service by commissioning his attractive new work Reflections: Serenade No. 2 for wind decet. Two lively and energetic movements surround a reflective Andante espressivo written in memory of the great English bassoonist William Waterhouse, who died last year. This movement begins and ends with extended bassoon solos, played with style and skill by Simon Payne. Reflections will quickly enter the repertoire. The concluding piece was the Serenade (Opus 7) for wind decet, the work that launched the career of the seventeen-year-old Richard Strauss. The balanced and fluent ensemble of the Sinfonia did full justice to the romantic, lyrical lines, the varied instrumental colouring and the detailed rhythmic and harmonic support. This delightful concert in the excellent acoustic of St. Mary’s displayed the musicality and skill of the wind players of the well-established Oxford Sinfonia to full effect, and demonstrated the variety and depth of the repertoire for this genre.